I assure you, knitting is taking place. I am working on the Cameron Shetland Shawl by Susan Miller. I am working from the center out, which means I only need navigate 125 stitches at a time. The stitch repeat is only 10 or 12 stitches. Oh the numerous ways a 10 to 12 stitch repeat can go wrong. Let’s count them, shall we? 1) Knit the wrong row entirely. Repeat this periodically throughout the 242 row process. 2) Knit while someone is talking to you. 3) Knit while watching television. 4) Dog steals knitting and dismantles it to his liking. Dismantle what dog has dismantled and try to pick up stitches from life line. 5) Realize you can’t see life line because it is a very pale lavender and fades away completely against the white frothy-ness of the Shetland yarn. Starting from the beginning is the only answer. Do not cry. It is too early in the process for crying. 6) Toss stash for a darker life line yarn. Come up empty. Have an argument with yourself over whether to shelve the knitting until you go to the store and get a darker yarn or to continue with the very pale lavender because you’re afraid a darker cotton yarn might unintentionally stain the white Shetland yarn. When the migraine appears, knitting is done for the night effectively ending the debate. Take two headache pills. Go to bed. 7) Memorize the repeat of a row, only memorize it wrong. When you get to the end of the row notice the stitch count is off. Rip back to the very pale lavender life line and try to pick up the tiny white stitches. Make a cup of Chamomile tea, drink it slowly while repeating the words “It’s okay. Everything will be fine.” Put the knitting away for the night. 8) Memorize repeat of row, memorize it correctly. At end of row stitch count is off. Carefully review row. Repeat the review at least 3 more times. Fail to see where the mistake is. Rip back to the very pale lavender life line. Crying is now allowed. Of the 242 rows I managed to knit 60 rows successfully. Holy cow, that sounds like what purgatory must be like! 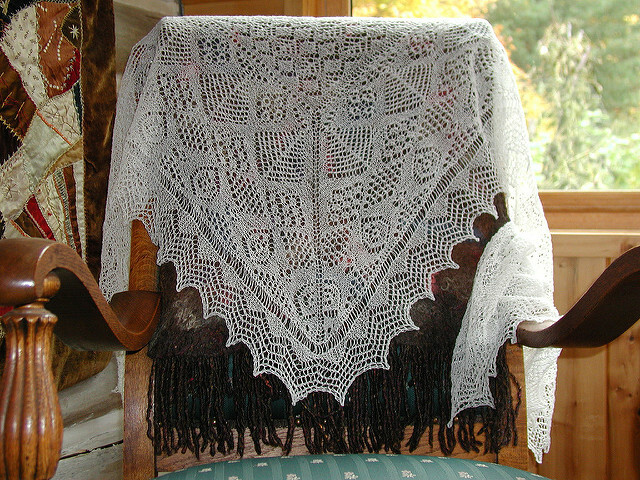 If it is any consolation, that shawl is absolutely beautiful. Worth every tear and exercise in ripping. What are you going to torture yourself with next? All ready on the needles. A small asymmetrical scarf by Kim Hargreaves with cable and lace. This one I am keeping.